I swear I spend half of my time complaining about weather on this website, but this week I have good reason. Monday night we got some serious hail. Typically we experience 30-45 seconds of hail when the weather front first comes through, but this time it just kept coming down for a good ten minutes. You’ll see evidence of this on the produce like white blotches on the peas where they took a hailstone or greens with healed over holes. Some of the best advice I got from my mentor on whose farm I apprenticed was “if you get hail, don’t even look at the plants for a couple days.” Even though hail inflicts a lot of damage, it’s amazing how quickly the plants recover. Now, today, I’m sitting in our kitchen writing this because our power’s out after a major streak of lightening tried hitting our house while a rain poured on my head out picking peas. I can’t even fill the tanks to harvest and wash produce. 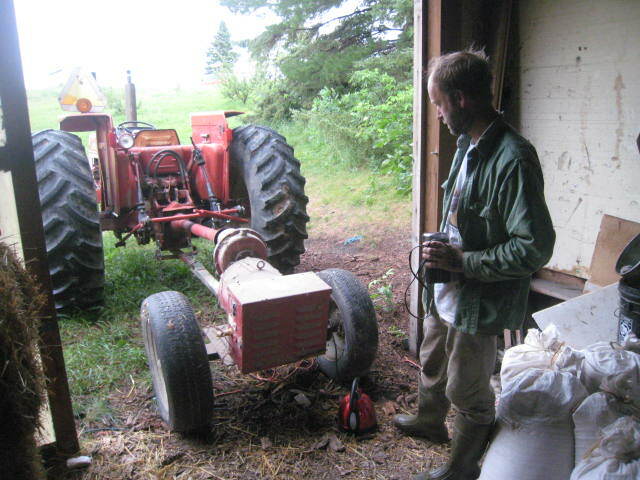 But desperate times call for desperate measures, so I fired up the PTO generator just to make some coffee. Snap peas: fatter peas, which are edible pod, so don’t try shelling. You’ll see these white marks where hail hit, but I’ve been eating a bunch in the field and I think they are fine. Radicchio: the small round red green. It is often mixed into a mix of other greens in a salad. It’s got a pretty strong nutty, bitter flavor, so it’s not for everybody. Steam kohlrabi until tender, about 10 minutes. In a bowl, mix together oil, honey, and mustard. Taste and adjust for flavor. Toss with cooked kohlrabi. Makes 4 servings.